WAIST HIGH: Happy 25th Birthday Avalon. 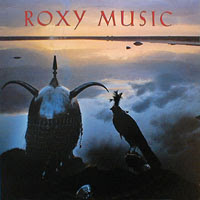 Released in the summer of 1982, Avalon was Roxy Music's eighth studio album and is generally regarded as the culmination of the smoother, more adult-oriented sound of the band's later work. It was a huge commercial success, hitting #1 in the UK and staying on the album charts for over a year. Avalon was the band's only platinum record in the US. Continuing a Roxy Music tradition, Bryan Ferry's girlfriend Lucy Helmore appeared on the cover wearing a medieval helmet and carrying a falcon. The image evoked King Arthur's last journey to the mysterious land of Avalon. The lush arrangements and synthesizer drenched sound of Avalon later found its way onto Ferry's solo follow-up album Boys and Girls. The single, "More Than This," preceded the album and was a Top 10 hit in Britain, Australia, and most European countries. "More Than This" is unusual for a pop song in that Ferry's vocal ends at 2:45 minutes, leaving the last 1:45 minutes as a synth-driven instrumental. It has since become regarded as a classic Roxy Music song. The title track was released as the album's second single and also became a UK Top 20 hit. A third extract, "Take A Chance With Me," with a remixed version of album track "The Main Thing" on the b-side, reached UK #26 and was Roxy Music's last UK hit single. Original Roxy Music member Brian Eno is often credited as being the creator of "ambient" music. "Few albums are truly captivating from start to finish. This is one of them. Avalon is simply exquisite."